The mission will be carried out in 2023. The European Space Agency (ESA) is set to launch another mission to a space rock in 2023. The mission will be carried out alongside NASA's mission to the same asteroid. However, the ESA's spacecraft will attempt to fly itself. If everything goes according to the plan, this will be a helpful feature for future space travels. A spacecraft that is capable of navigating itself will be a huge leap for technology. The spacecraft will also be able to avoid space debris which will make it less stressful for space agencies. Dubbed 'Hera,' the ESA spacecraft is meant to visit the asteroid Didymos and its tiny satellite known as Didymoon. Hera will take flight alongside NASA's Asteroid Impact and Deflection Assessment (AIDA) mission spacecraft. 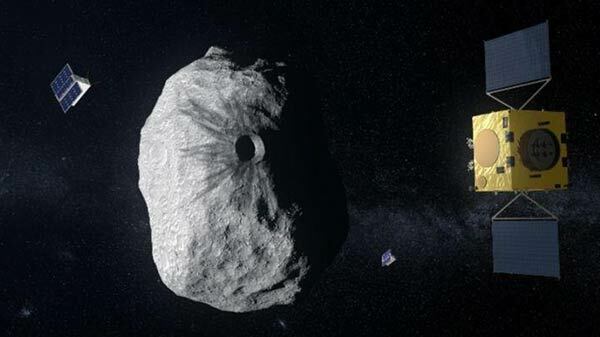 The AIDA mission would focus on NASA's Double Asteroid Redirection Test (DART). This is basically a defense system for Earth that would redirect asteroids that are hurtling towards our planet. The spacecraft will crash directly into the space rock. However, ESA's Hera will detach from the launch vehicle and orbit around Didymos, and will examine the collision from a distance. It will then swoop in and examine the crater after the collision. navigations systems similar to what is seen on self-driven cars. "If you think self-driving cars are the future on Earth, then Hera is the pioneer of autonomy in deep space," Paolo Martino, the lead systems engineer for Hera, said in a statement.